60m², spacious balcony, comfortable, well equipped, TV, dishwasher, nice, tidy, optional services: bed linen and towels, cot, final cleaning. 60sqm 4-room apartment for up to 10 people with an equipped kitchenette, a living room with a double sofa bed, a bedroom with a double bed, a second bedroom with two single beds, a third bedroom with a double bed and two single beds, a bathroom with separate WC. 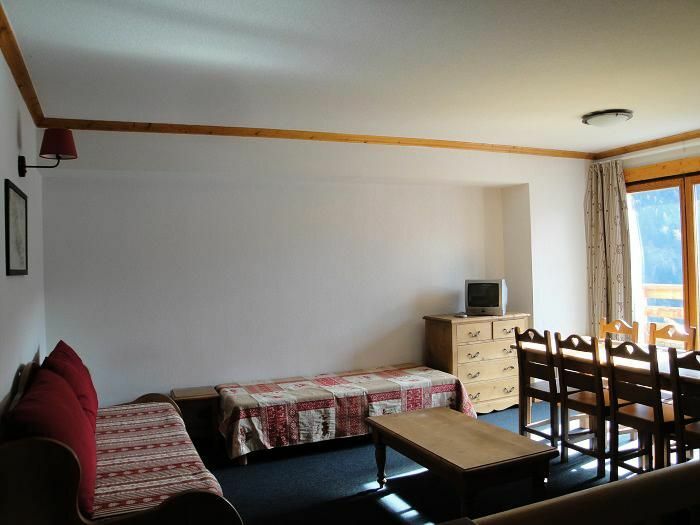 Other possibility: 2 bedrooms with a double bed each, 1 & nbsp; with 2 single beds and a cabin with 2 bunk beds. Note: Some apartments have an additional bathroom. The apartment is equipped with a living room with a kitchenette equipped with hotplates, a refrigerator, a dishwasher, a coffee maker, a microwave oven and all necessary utensils for 10 people. From Grenoble to Vaujany (50 km) by RN 91 direction Briançon then Valley of the water of Olle - Vaujany. TGV Paris - Grenoble (3 hours), regular bus connection Grenoble / Bourg d'Oisans / Vaujany direct during the winter school holidays.